"The routine is simple enough to learn, with each of the techniques clearly and effectively demonstrated, and after a single session my own skin tingled and my face felt refreshed. A solid introduction to an ancient art, this is recommended. Aud: P. (J. Asala)"
women worldwide have purchased this unique and helpful facelift product. © Rainbow Rising Productions and Chuanheng Management. "The Secret To Looking Younger Is In Your Hands!" The Chinese Acupressure Facelift has been discussed on News Health Reports by the following TV stations nationwide. Check it out! View three acupressure points and learn about their health benefits by watching a sample of the tape. *Windows Media Player Required to View video clip. Maybe you looked in the mirror this morning and another wrinkle or line showed up, or you noticed a little sagging around your jawline. Now you're thinking about surgery, or maybe that cream that costs $60.00 a bottle. What about botox? Don't put yourself through that. Take control. You can look younger, more radiant, and healthier naturally. Now there is a facelift you can do at home. Stimulating and massaging facial acupressure points with your fingers and hands, can erase wrinkles, remove lines, and return the vibrant glow of youth. Massaging acupressure points a few minutes a day, tones facial muscles, increases circulation, and smoothes out the skin. Additionally, you might even ease that stress headache you've had since lunch, or relieve the eye strain that hits after four hours on the computer. In fact, this unique facial not only helps you maintain youthful radiance, but also soothes your nerves and helps you relax after a long hard day. Women of the Orient have known about this technique for hundreds of years. Now you know about it too. Drs. David and Ming Ming Molony share and demonstrate a non-surgical facelift that you can do in the privacy of your own home, in the tub, watching TV, whenever. It's natural. It's painless. It's inexpensive. It works. Try a natural facelift technique that is ancient, yet timely...easy yet effective. Drs. 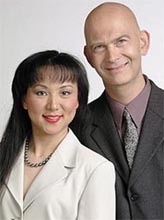 Ming Ming and David Molony have practiced traditional Chinese medicine since 1985. Ming Ming graduated from Nanjing College of TCM. She is Vice President of the American Association of Oriental Medicine, and David has served as Executive Director for the last nine years. David graduated from San Francisco College of Acupuncture and Oriental Medicine and took advanced courses in acupuncture and Chinese herbal medicine at the Nanjing College of TCM. Together, they have written the top selling book "AAOM'S Complete Guide to Chinese Herbal Medicine" Published by Berkley/Putnam. 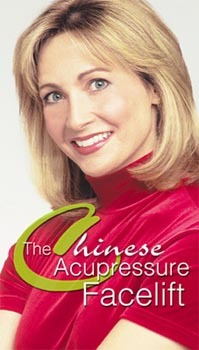 In 1989, Host and co-producer Terry Harris came up with the idea for a video on Acupressure Facelifts. Terry is both an educator and commercial actor, and many times he experienced the benefits of an acupuncture facelift. He just wished that it lasted longer, and he could do it at home. That's when he decided to go out and find an acupuncturist that would be willing to share an acupressure facelift with the public. No needles, no hassle, and you could do it whenever you wished. Terry interviewed several acupuncturists from New York City to Philadelphia, and no one seemed quite right. Then, in 1998, his wife Debra introduced him to David and Ming Ming Molony. Debra Glass Harris met David and Ming Ming Molony in 1992, when she interviewed them for a local TV show she was producing and directing. Both David and Ming Ming are nationally recognized in their field, and Debra and Terry met with them. Within a very short time, the Chinese Acupressure Facelift was born. "I have been doing a trial on a new product on the net - Chinese Acupressure Facelift. I totally love it." "The tape was a pleasure to view...very well executed, easy to follow, and the part I appreciated most was the explanations of what the points were called, and their specific benefits...Thank you os much for producing such a wonderful tape!" The secret to looking younger is in your hands! Completely natural and only takes a few minutes a day. No needles, no pain! Website design and hosting provided by Web Design GT.